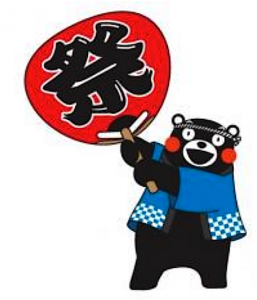 Kumamon, the bear mascot for Kumamoto Prefecture, will appear at a series of events in Southern California this weekend, Aug. 18-19. Since the massive earthquake in Kumamoto Prefecture, recovery has been moving forward steadily. Kumamon will help raise funds for Kumamoto’s reconstruction. • Kumamoto PR Booth on Saturday and Sunday at JACCC Plaza, 244 S. San Pedro St., from 10 a.m. to 5 p.m.
• Movie screening on Saturday at Miyako Hotel, 328 E. First St. “Gift of Memory 1,” 1 to 11:40 a.m.; “Gift of Memory 2,” 11:40 a.m. to 12:25 p.m. Free entry; 80 seats available. • Ondo (public street dancing) on First Street between San Pedro and Central at 4 p.m.
• Movie screening at New Gardena Hotel, 1641 W. Redondo Beach Blvd. “Gift of Memory 1,” 5 to 5:40 p.m.; “Gift of Memory 2,” 6 to 6:45 p.m. Free entry; 80 seats available; reservation required. • Fundraising mini-concert at New Gardena Hotel from 7 to 8 p.m. Program: Kumamon Show, flamenco dance, Tsugaru shamisen, saxophone, singing. Tickets ($20) can be purchased at Happy Square, 2139 W. 182nd St., Torrance (Nijiya Mall). All proceeds of this event will be donated to Kumamoto Prefecture through Nanka Kumamoto Kenjinkai. For more information, contact Michiyo Ando at (310) 874-3363 or [email protected] or visit http://loveforkumamotoinla.jigsy.com/ or www.facebook.com/nankakumamotokenjinkai/. Presented by Kumamoto City with additional support from Kumamoto Prefecture, Nanka Kumamoto Kenjinkai, Japan Film Festival, and Love for Kumamoto in L.A.-Together Stand for Japan.